Thought I would post this info in case someone else was looking for different filter options on the Grizzly. The above two filters need a 67mm filter wrench. The filter 5GH-13440-60 can also be used, it is longer and only about 2mm smaller diameter. This is the filter used on the 686cc motors and the Wolverines. The above filters use a 65mm filter wrench. The following two should also work but the overall diameter could have clearance issues in some cases. Wanted to pass the info along, I haven't been thrilled with the factory Denso filters in the past. @SavageGrizzly if you don't mind me adding to it, I've also found that Napa carries correct filters for them as well. Gold series part # is FIL 1358. They also offer it in their other three tiers as well. I've been running this one for the last two changes. No problem adding to the list at all. Just wanted to share what I had found so far as it took some time measuring and matching filters, as I wasn't happy with the factory filter. If this post helps save someone time trying to figure out what filter options are out there its served its purpose. Good tips. I found out at my spring oil change on the Grizz that the oil filter for the Grizz and my Yamaha 25 HP 4 stroke outboard boat motor are one and the same. Makes me happy because I've been using the Napa Gold filters on the OB for years along with the full syn. oil. Works like a champ. Good info here @SavageGrizzly . There have been many threads on this over the years but updated findings are always appreciated. Thanks! I know @SavageGrizzly started this thread in the context of higher quality, higher capacity, longer life filters than OEM, and it is great info. But figured I would add what I've found in sourcing "standard" quality filters. I run standard because "standard" these days means 5000 miles in my car with conventional oil, and I figure that to be putting a filter through way more between changes than my Grizzly filter is exposed to between changes. So I go to O'Reilly and buy the MGL51358 @ $5 each: https://www.oreillyauto.com/detail/b...l51358/4444870 technically I pay about $2.80 each because of a generous discount they give to all employees at the company I work for. But $5 is still a good price. Or if you have the clearance, MGL51356 is the same but a little longer. All of the above mentioned ones are made by Wix, so I know I'm getting a good filter. And I know @2wheelATV has vouched for the surprising quality of Supertech filters here before. I just tend to struggle with finding up to date info online of their specs and which exact part numbers are available and the right fit. I know I'm way late to the party, but this puts my mind at ease. Went to my local Yamaha dealer a couple weeks ago for some Yamalube and a filter for my 16 Grizzly (708). He gave me the 5GH filter instead of the 5DM. Not knowing, I put the 5GH on my bike, filled her up and then realized I had the wrong one. Took it for a ride and all seemed well. Went to the dealer yesterday for some 2000 wolverine parts and asked him, and he ended up giving me the proper filter no charge, but since they are both compatible, I will just leave the one on and save the other for my next change. I know I am a little late to this party but I figured it was a good place to add a little more oil filter info. For the 708cc engine K&N 147 wrench off oil filter is the one to use if you dont like using band clamps. If you click on Product specifications in the link it will show the thread size, OD & Height of the filter. I believe but not sure the K&N 204-1 is for the 686cc engine?? Or Maybe something else altogether. 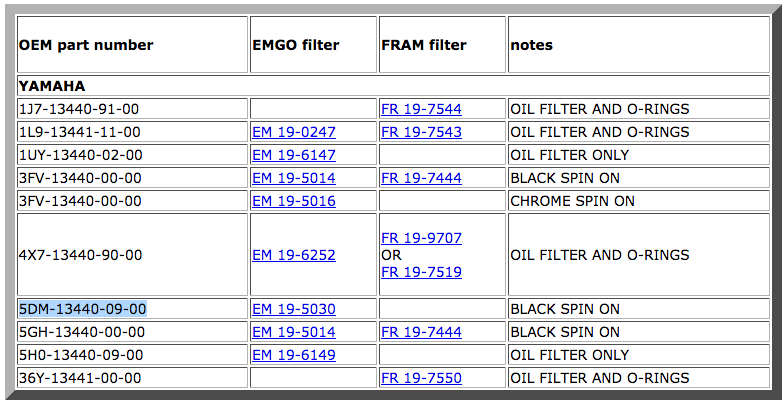 And here is a screen shot of Yamaha to Emgo to Fram Part numbers as well. From a lot of reading about guys who race muscle cars, one guy claimed that the best he had found was Napa Gold and Baldwin filters. This was a study of over twenty years. Years ago I found out from a buddy who had just Bad Luck that a lot of oil filters use a string to hold there oil filter together. In this case it was a Fram oil filter. To make a long story short he was in his 1979 F150 351cu crossing the Mackinaw Bridge on Labor day and lost all oil pressure. After the engine was tore down to see what happened the mechanics noticed the oil filter came apart and closed the oil flow off starving the engine for oil. Fram ending up paying 70% of the rebuild. At that time frame I started to look at all filters to see who did not use a string to hold there oil filters together. Napa Gold was the first oil filter I found that did not use a string to hold them together and you could tell holding it in your hand it had Quality written all over it as it weighed a good 6oz heavier than a Fram. I still have some new unused oil filters for the 90's fords 5.0L & 5.8L laying around as I switched to Napa Gold and never looked back. With today's synthetic oils good for 10,000 miles plus I switched to K&N's on all my vehicles as its a 10,000 mile oil filter. Not that I go 10,000 miles on my oil change but 6-7K is the normal. Now that this subject has came up its time for me to see if K&N uses a stupid string to hold there oil filter together as well. I dont believe the K&N's use a string but I will find out. If so I wont be putting them back on. I do know the majority of oil filters back in the 80's & 90's were held together with a string though. Last edited by Zrt1200; 04-13-2019 at 08:04 AM. Well I guess I should have did a google search before sending K&N a e-mail. No Strings in a K&N. Well through a little YouTube searching it looks like Fram does not use a string anymore but they still dont have any Quality built into them. Oops, forgot to mention Napa Gold is made by Wix. Thank you for that. I had no idea Fram made garbage and called it a filter. Glad to know we use napa gold at my office on the work trucks. The recommended stock K&N oil filter for the 2018 Grizzly is the LE 708. With research, I discovered the K&N HP-1010 fits perfectly. The advantage of the 1010 over the LE 708 is it is part of their upgraded Gold series. It is also larger in size and capacity over the LE 708. The 1010 is also easier to install as it has the Nut welded to the filter.